The year is 1870. For centuries, sails have ruled the seas, but now the steam engine is beginning to dominate. Shipbuilders are experimenting with new designs, competing for the prestigious Blue Riband, which honors the fastest ship to cross the Atlantic. Their efforts are watched closely by the world's imperial powers; for the strength of every empire depends on its commercial and military fleet. It is an exciting time to run a shipyard. Found a company. Build a fleet. Show the world that your ships are the fastest, the safest, and the best. We're in 19th century, sea transport is more and more important. Both corporations and naval forces require newer and newer ships. Try to put yourself in the role of their manufacturers. Hire employees, buy accessories, get favour of evaluating committees. Don't forget to rent a canal and you can heave anchor. The game ends when the countdown marker reaches the finish space. (It can also end early if the players run out of Ship Cards). Bonus points are scored for Government Contracts, and the player with the most points wins. 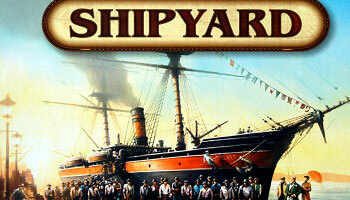 You take the role of a shipyard owner. Your goal is to build the best ships within the allotted time. As your completed ships leave the yard, they are evaluated on many criteria and your company's stock rises. You decide whether to build fast merchant ships, trans-ocean steamers, or small sailing yachts, while keeping in mind the bonuses you can receive from your secret government contracts. Game Board in two halves. 2 x 12 Government Contracts in two decks. Employees allow you to use an action more productively or to attach more Equipment or Crew onto your ship. There are several types of Employees, distinguished by color. When you hire an Employee, his beneficial effect is yours to use for the rest of the game. The effect can be used every time it applies. Your completed, point-scoring ships remain on the table in front of you after their Shakedown Cruises. At the end of the game, your entire fleet is evaluated, and you may earn extra points from your Government Contracts. 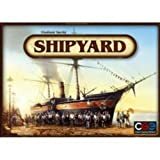 Note that Equipment and Crew that are left in your Shipyard do not score any points.